SUBHEAD: Tech innovation is what's killing jobs. And the revolt after Trump will be a real Luddite movement. 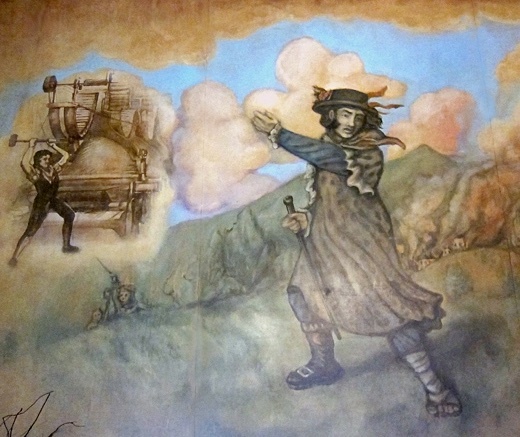 Image above: Mural in Portland, Oregon restaurant depicting Ned Ludd exhorting "Luddites" to destroy technology taking their livelihoods. From (http://www.foodforthoughtmiami.com/2011/09/ned-ludd-portland-oregon.html). The tech industry played an influential role in the outcome of the US Presidential election. Not just in providing the medium for fake news and propaganda. The root cause is job destruction by automation, which drove a base of dissatisfied Rust Belt voters to support Trump. Job destruction is accelerating — and if tech doesn’t get ahead of this problem there will be a significant populist backlash against the industry and its ability to progress. This post was inspired by a senior in high school, Bianca Al-Shamari, who is writing an article on job automation and the impact on future generations. Fifty percent of the jobs will be gone in about twenty years. Not from the great sucking sound of jobs to Mexico that can be stopped with a wall. Not from moving offshore to China. From automation that is moving quickly from blue collar manufacturing to white collar information work. Second only to climate change, this is the greatest disruption of our time, and I don’t mean that word in a good way. 94% of the new job creation since 2005 is in the gig economy. These aren’t stable jobs with benefits on a career path. And if you are driving for Uber, your employer’s plan is to automate your job. Amazon has 270k employees, but most are soon-to-be-automated operatons and fulfillment. Facebook has 15k employees and a $330B market capitalization, and Snapchat in August had double their market cap per employee to $48M per employee. The economic impact of tech was raising productivity, but productivity and wages have been stagnant in recent years. The future of work isn’t a new debate. But it is very unevenly distributed. Doug Engelbart pioneered augmentation just as most of his Stanford Research Institute colleagues were thinking through artificial Intelligence (AI) for automation. We are at the beginning of the fourth technological wave of innovation. After the Agricultural, Industrial and Information Ages, there’s something else. The canary in the coal mine is trucking. Truck driver is the No. 1 job in the USA. Driving a truck is a respectable job that pays well enough to provide for a family without a lot of education. It's in trouble. The autonomous Uber Freight is taking orders, powered by Otto. Uber's $680M acquisition of Otto's 91 employees equals an effective valuation of $7.5M per employee. Or you could say $200 per US trucking job killed. Let’s try to humanize this for the geeks in the Valley. Someone at your holiday family table will lose their job. Imagine that person is a truck driver. You know those high school friends on your Facebook? Some of them will lose their jobs and their families. Knowing all this is going to happen, what do you tell them? What can they really do? Maybe someone has two years and resources to retrain themselves. But if half the jobs are gone in twenty years, how many times will they have to retrain? What should kids study in school when today's jobs wont' exist soon? But let’s stay in our valley of thought. Hey, Y Combinator has a Basic Income experiment alongside some socialist countries! People won’t have to work for a living. Pot is legal now, districts are gerrymandered, and we’ll find new thing to sell them that will give them purpose. Someone needs to explain to me how Basic Income isn’t the most politically unrealistic idea of our time. Being a Luddite in modern terms has been broadly defined as "people not adopting technology." Like people that didn’t “get blogging.” But the term comes from the people who destroyed labor-saving devices in the British textile industry during the industrial revolution. They acted on orders from a mythical general Ned Ludd to rebel against the technology that was destroying their jobs. In 4 to 8 years there will be a populist politician who will point the finger at the tech industry as enemy number one. In a way, Trump already has. This person will yield a backlash against tech that will stunt progress and make it a far worse instrument of her or his control. This is more than stones hurled at Google Buses. When people start to feel their unhappiness is because of tech, the post-truth era of Trump and post-ethics of the GOP elite will pale in comparison to the real movements someone could control. Tech still has time. Lean your products towards augmentation and job creation. Solidify your principles for what is humanely right against fear-mongering and scapegoating. Foster education, and not just what worked for you, but what junior colleges can do to help people transition. Tech company policy needs to go beyond the regulations that risk a single company wants to manage, and reflect it’s inherently progressive value set. Admit disruption is a bad word, and at least cause-relate your marketing and mission.